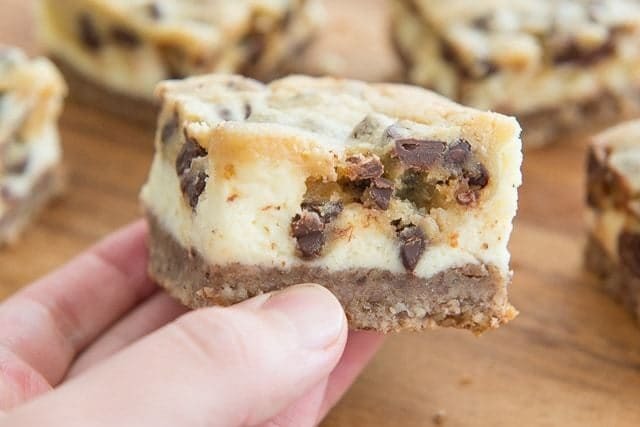 These Cookie Dough Cheesecake Bars combine multiple desserts into one bite! 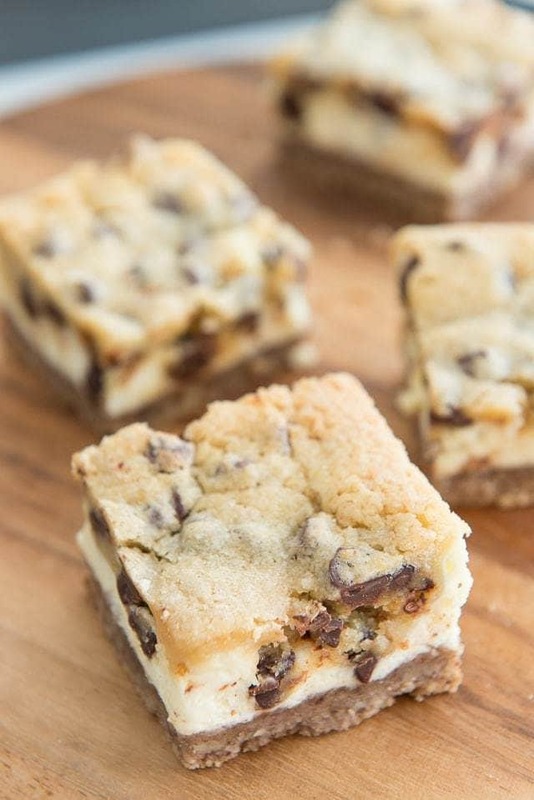 You have a crumbly pecan crust on the bottom, creamy cheesecake in the middle, and chocolate chip cookie dough on top. I am the most indecisive person by nature, so whenever I get to pass on making a decision, I feel a great sense of relief. My belief is that indecisiveness stems from a general sense of FOMO (fear of missing out), so you never want to pick between a set of options. You want ALL the options! 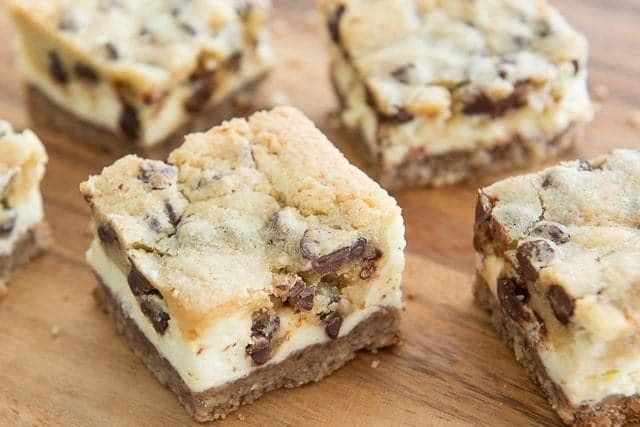 These Chocolate Chip Cookie Dough Cheesecake Bars are for my fellow indecisive souls, because you get to have cheesecake, chocolate chip cookie, and pecan shortbread in every single bite of dessert. But course, these are for my decisive friends too, because everyone deserves to eat these. The most unexpected bliss in eating this bar is the contrast in different textures and flavors. 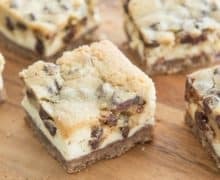 The pecan crust is nutty and crumbly, the cheesecake is ever so silky and smooth, and you have the big bits of chocolate chips in the cookie dough. Like many bars, these also travel well, which makes them perfect for bringing to potlucks or gifting to friends. There’s something about these that people go crazy for. For the crust, I like to do what is sort of a pecan shortbread crust, except the pecans make up the bulk of the mixture. 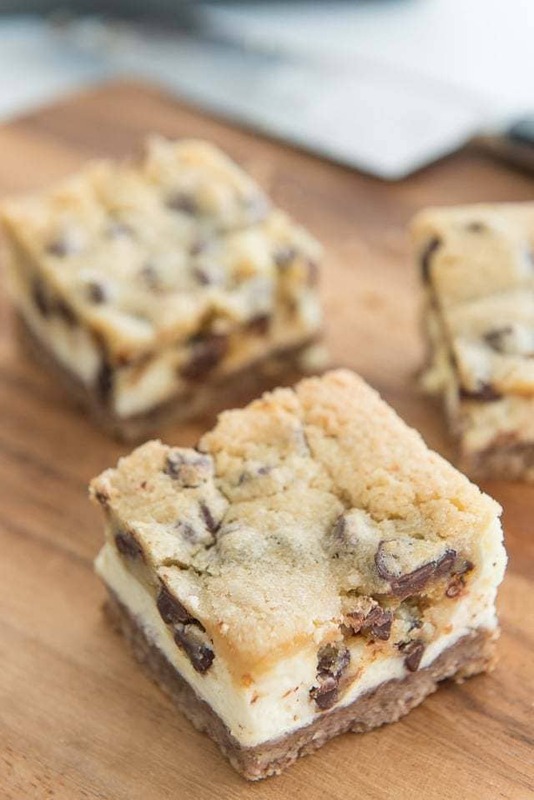 Bake for 10 minutes, and in the meantime, make the cheesecake filling and the chocolate chip cookie dough. Then the cheesecake filling is made with four ingredients, just cream cheese, sugar, egg, and vanilla, all beaten together until smooth. 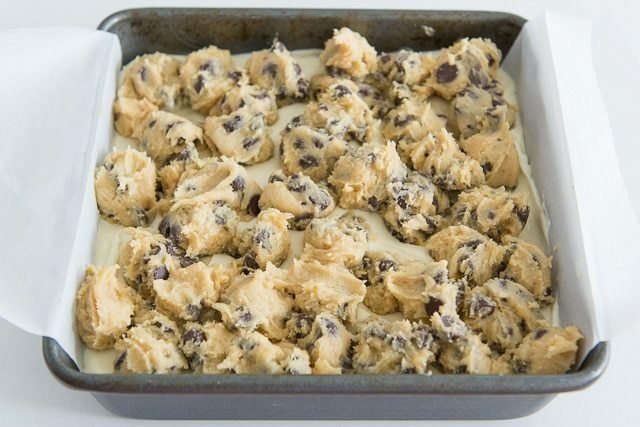 Bake between 30-35 minutes, depending on how “doughy” you want the chocolate chip cookie dough to be. Chilling ensures that you get clean slices and also that the dessert doesn’t slump as you lift it out of the pan. Below is the printable recipe and a full video of the process. Enjoy! Preheat the oven to 325 degrees F. Line an 8×8 baking pan with parchment paper and let the paper hang over the sides. 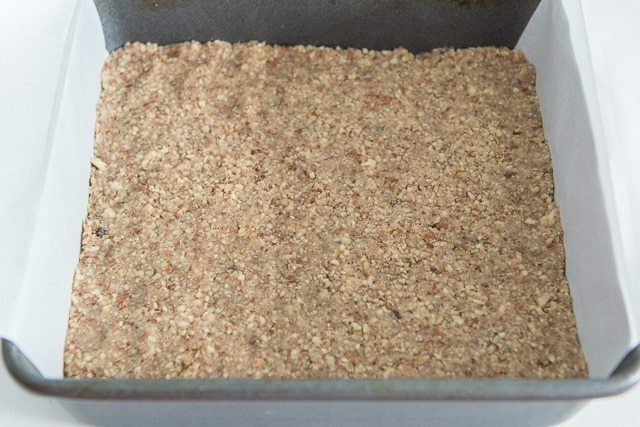 Make the crust: Stir to combine the pecans, sugar, and flour. Stir in the butter, until crumbly and evenly moistened. Transfer the mixture to the pan, then press firmly and evenly into the bottom of the pan. Bake for 10 minutes, then transfer to a wire rack to cool. While the crust cools, make the cookie dough by beating together the butter, brown sugar, sugar, salt, egg and vanilla, until smooth. With the mixer on low, slowly add the flour. 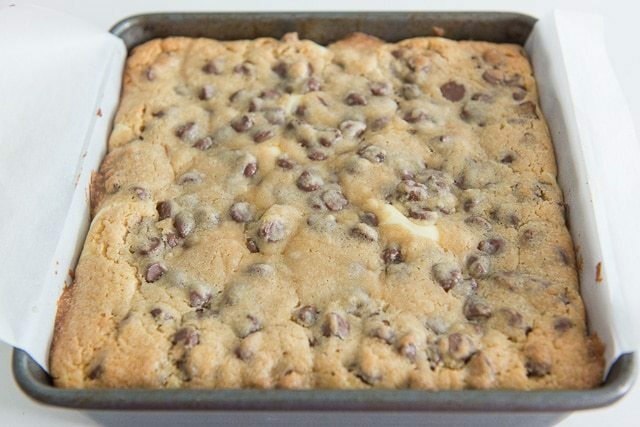 Right before the flour has been completely mixed in, add the chocolate chips. Set aside. For the cheesecake, beat the cream cheese and sugar together until smooth. Add the egg and vanilla and continue mixing until smooth. Pour the cheesecake batter onto your crust. 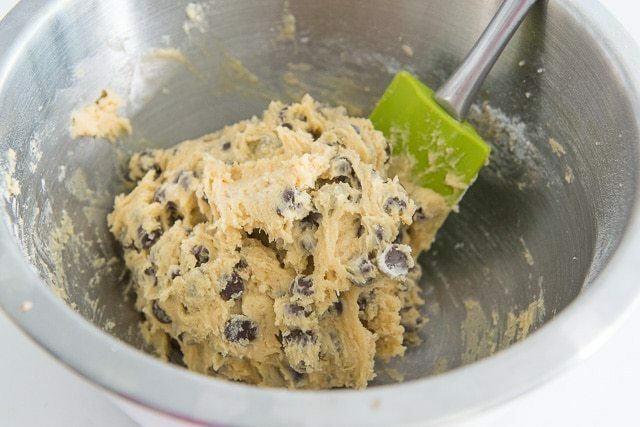 Then add your cookie dough on top of that by dropping small clumps on top. Bake for 30-35 minutes. 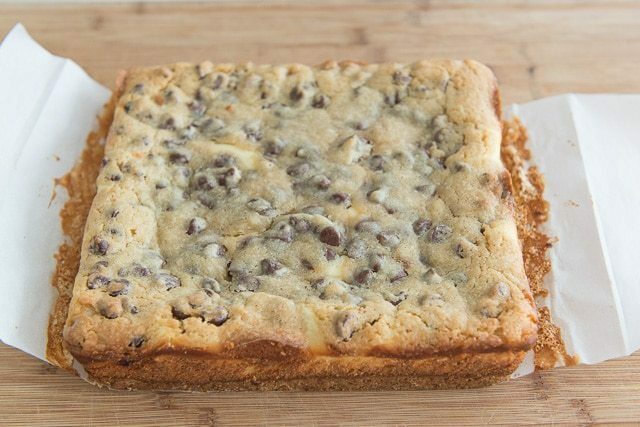 After 30 minutes, the cookie dough will still look gooey, but that’s how you want it for a more cookie dough-like experience. If you want a more crisp and cookie-like experience, you can fully bake for a total of 35 minutes. Chill the bars completely in the fridge, then cut into bars. This ensures you get clean slices. Enjoy! Yum!! 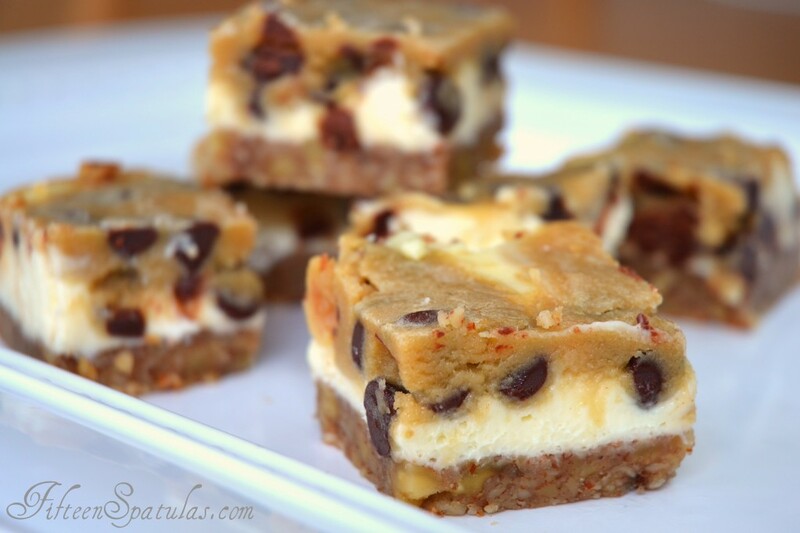 Love that you used a pecan crust instead of a graham cracker crust. These look amazing! Pecan crust?! That sounds absolutely heavenly!! 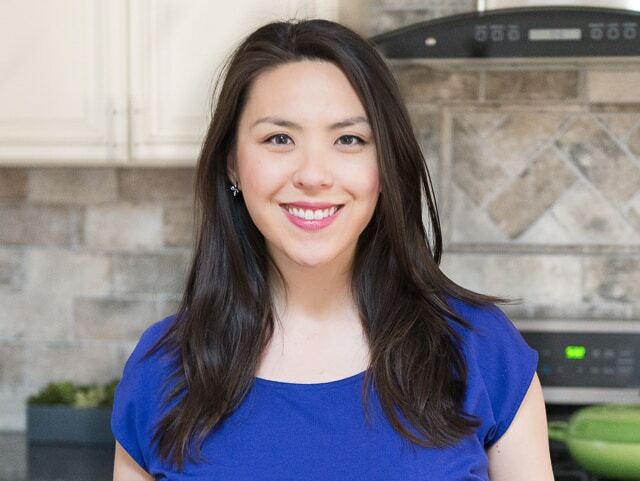 I keep sending your posts to my daughter-in-law and she just loves your recipes….